Dancing is an excellent way to keep yourself in top shape, regardless of your age. Apart from being great fun, dancing has many health benefits too. Read on to find out about these several health benefits you can enjoy by making dancing an everyday routine. Dancing is one of the best ways to break everyday monotony and lift yourself up on the physical, mental and emotional front. Whenever anyone thinks about starting a new exercising routine, he/she normally tries to make it as much fun as possible, and dancing is exactly that…. Fun. Dancing is an excellent physical activity for people at a higher risk of cardiovascular diseases. An Italian study revealed that people who had suffered cardiac failure, significantly improved their overall heart health, life quality and respiration by practising dance as an exercise routine on a daily basis, compared to the people who depended only on walking or riding bicycles for their daily exercise needs. Another major benefit of dancing is weight loss, provided you are consistent with your routine. A study published in the Journal of Physiological Anthropology revealed that an aerobic training exercise program with dance as its core component is just as effective for improving one’s aerobic capacity and for weight loss as jogging and cycling are. Are you someone who lacks energy all through the day? Dancing can help you significantly in staying upbeat, no matter what time of the day it is. The Scholarly Publishing and Academic Resources Coalition featured a study emphasising how participating in a weekly dance program can improve people’s overall energy levels and physical performance. Flexibility and dancing are something that go hand-in-hand. This is the reason why all dance classes begin with warm-up exercises, which are nothing but different types of stretching routines. When you dance, it becomes important that you push yourself to a certain range of movement, bringing all your muscle groups into play. Dancing improves the strength levels of the dancer, forcing his/her muscles to push against his/her own body weight. The majority of dance forms, including ballet and jazz, feature plenty of movements that need a lot of strength to perfect. For instance, jumping is an integral part of these dance forms and it requires a lot of strength, especially in the leg muscles. Dancing improves the endurance levels of the body. Endurance is nothing but the muscles’ natural ability to work hard for extended periods of time, without getting fatigued. Dancing on a daily basis is the best method of increasing one’s resistance and endurance levels. Dancing is a physical activity that almost everyone can enjoy doing. Have you ever seen someone dancing with a sad face? No. Anyone who dances automatically gets a big smile on his/her face. Such laughing and smiling while dancing is something completely natural. It’s a sign that the person is enjoying himself/herself completely. 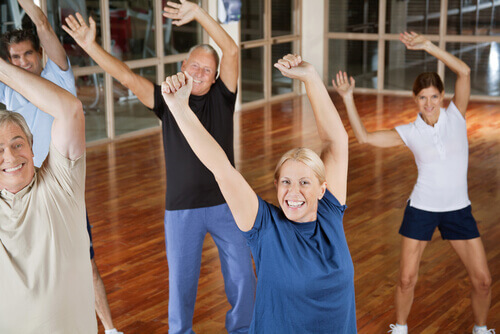 Unlike other types of exercises, there’s no age limit when it comes to dancing. You can dance to your heart’s content and enjoy its positive health benefits, no matter how old or young you are. Many studies have proven that regular dancing can help in prevention of mild depression and improve the person’s confidence levels. Depression is becoming highly common in adolescents and adults of all age groups. One such study got featured in the International Journal of Neuroscience. It revealed that dance therapy can not only help in overcoming depression, but also reduce the stress levels by regulating the dopamine and serotonin levels in the dancer’s body. As dancing is also a social activity, it can help people overcome feelings of loneliness (commonly seen in depression patients), especially elderly people who may be alone for much of the day. Dancing also contributes to improvement in self-esteem and confidence levels. Whenever you learn and master a new dance step, you’ll naturally experience a spike in your confidence levels as well as your energy. Slowly, this confidence will start reflecting in other areas of your life too. As mentioned earlier, dancing is a type of social activity. Studies have revealed that socialisation and strengthening of social bonds with friends can go a long way in developing positive attitude and improving self-esteem. Dancing provides ample opportunities to befriend other people. For instance, joining dance classes and mixing with others is one of the best methods of improving your social skills and self-esteem. Dancing also provides a general sensation of overall well-being as the physical exercise involved in it reduces the tension and stress levels. A study featured in the New England Journal of Medicine showed that dancing has the ability of increasing your memory power and preventing diseases like dementia as you grow old. Science has also proven that aerobic exercises can reverse the hippocampus volume loss. Hippocampus is the brain area which controls memory and is known to slowly shrink during adulthood, leading to memory problems and even dementia in old age. A study published in the New England Journal of Medicine that involved elderly participants, found that regular dancing helps in preventing harmful effects of Alzheimer’s disease and other kinds of dementia. Dancing improves mental clarity regardless of the person’s age. It was also proven that people suffering from Alzheimer’s disease can remember the forgotten memories by dancing to music they used to listen to earlier. Dance manuals and several written texts over the centuries have hailed the health benefits of dancing, even if approached as a type of physical exercise. Now, all thanks to scientific studies, it has been proven that dancing does have the ability of improving people’s intelligence levels. Decision-making is what lies at the core of intelligence. And the best way to improve mental clarity is by involving oneself in activities requiring quick decision-making. Therefore, you can improve your intelligence levels by simply working on dance styles that involve quick, split-second decision-making. Another way of doing this is learning anything new, not just dance, but anything that challenges your mind and forces your brain to form new connections. It’d be better if you involve yourself in difficult tasks as they’ll stimulate your brain and provoke it to form new neuron connections, thereby enhancing your neural connectivity. What’s the best music to dance to? You can choose from various dance styles including hip-hop, contemporary, bachata, samba, salsa, zumba, reggaeton, jazz and more. These all correspond to different music types. All dance types are equally beneficial as they help you stay healthy and lead an energetic life. All you need to figure out is the dance style or music that appeals to you the most. Simply follow your instincts and you’ll soon be dancing away to a healthy daily existence!